The AN/TPS-703 is an operating in S-Band solid-state tactical mobile midrange 3D air search radar. It's a slimmed down version of the AN/TPS-78 radar system, and a predecessor of the G/ATOR radar. The radar utilizes digital beamforming, i.e. a simultaneous stacked beam technology that provides full-time, full-volume coverage of all targets. 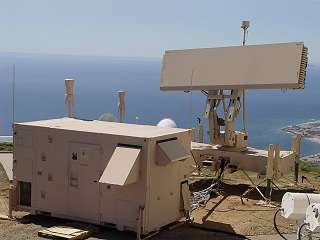 It can detect high-speed, high-altitude targets while simultaneously detecting low-altitude targets in heavy ground and sea clutter. All electronics including the transmitter are packaged in a single 14-foot (4.3 m) ISO shelter.